There are many golf courses in the United States named Mission Hills, but this article is about the club in the Palm Springs, Calif., area, that is the site annually of the LPGA's ANA Inspiration (formerly named Kraft Nabisco Championship and one of the tour's majors). That Mission Hills Country Club has 54 holes of golf, including the Dinah Shore Tournament Course, the site of the major championship ANA Inspiration for every year of the tournament's existence. 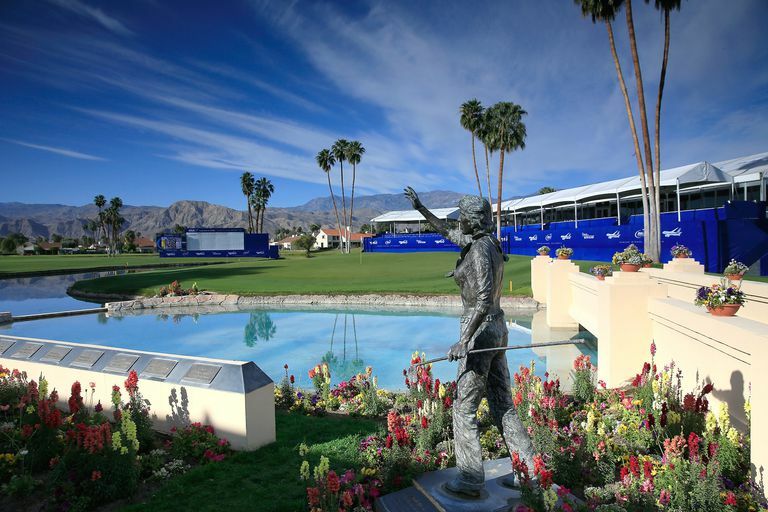 The course is named after entertainer Dinah Shore, who was long a major figure in Coachella Valley-region celebrity (and golf) circles, and whose name graced the tournament for the early part of its history. Because of its role hosting the LPGA major, when non-members talk about Mission Hills, we're almost always referring to the Dinah Shore Tournament Course. But the other two courses on site were designed by Arnold Palmer and Pete Dye. Mission Hill's most famous hole is the par-5, island-green 18th hole of the Dinah Course. The winner of the ANA Inspiration annually makes a running leap off the bank next to the 18th green, flying into the waters of the adjacent "Poppie's Pond." It's known as the Champion's Leap. Unlike many desert golf courses, the Dinah Shore Tournament Course (plus the club's other two tracks) has some tall, mature trees, and there are moderate elevation changes, too. Can I Play Mission Hills Country Club? Mission Hills Country Club is a private, membership club; non-members can play as the guests of members. One other option exists: the club has four "casitas" on-site. If you book a stay in one of these guest rooms, you have the option to play any of the club's golf courses for the standard member guest rate. There are 22 acres of fairway and 150 acres of rough, according to Golf Course Superintendants Association of America data, with 66 sand bunkers and six water hazards. Bermudagrass is used on the tees; the rough is a mix of bermudagrass and perennial ryegrass. Fairways use bermudagrass and Kentucky bluegrass; and the greens are bermudagrass, perennial ryegrass and Poa trivialis. Arnold Palmer Course: Opened in 1978, it was, Arnold Palmer's first desert golf course, according to the Mission Hills website. It plays to 6,834 yards. The club's website calls it a "member favorite," and mentions its "rolling fairways with many doglegs and strategic driving holes. Pete Dye Challenge Course: Opened in 1988, it plays to 6,955 yards. The Mission Hills CC website describes its "rolling fairways, elevated greens, classic deep bunkers," and mentions the railroad ties that designer Dye likes to incorporate into bunkheads around lakes. The ANA Inspiration, of course, which is played every year on the Dinah Shore Tournament Course. 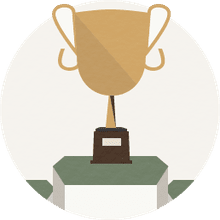 See our ANA Inspiration tournament profile page for the list of winners and more info about the tourney. In addition, Mission Hills has also been the site of the California State Open, the PGA Club Professionals Championship, in addition to qualifying tournaments for the PGA Tour, LPGA Tour and U.S. Open. The pond adjacent to 18 into which the winner traditionally leaps is called Champions Lake, or - more commonly - Poppie's Pond. "Poppie" is a reference to a nickname of Terry Wilcox, who was the Kraft Nabisco Championship's tournament director for 14 years (ending in 2008). Note that the two nines of the Dinah Shore Tournament Course follow the same configuration: par-3s on the fifth and eighth holes of each nine, par-5s on the second and last holes of each nine. LPGA legend Judy Rankin once lived in a house on the golf course and represented Mission Hills on the LPGA Tour. The so-called "Indio effect" is an important piece of local knowledge about playing the Dinah Shore Course. Indio is a city southeast of the course, and many putts on the Shore Course break in the direction of Indio. So knowing where Indio is in relation to one's position on the golf course can help in reading putts. After a second course was added to Mission Hills, the 18 we now call the Dinah Shore Tournament Course (which was unnamed originally) was referred to by members as "the Old Course." The "Old Course" was officially renamed the Dinah Shore Tournament Course following the death of Shore in 1994. At the 2009 Kraft Nabisco Championship, Brittany Lincicome won by making eagle on the final hole, the island-green 18th of the Shore Course. This is the only time a PGA Tour or LPGA Tour major has been won by a final-hole eagle. Mission Hills Country Club is also a major tennis venue, with 27 courts on site. The club was the host site for the finals of the 1978 Davis Cup, won by the United States over Great Britain. The American team included John McEnroe, Brian Gottfried, Bob Lutz and Stan Smith; the British team, John Lloyd, Christopher Mottram, Mark Cox and David Lloyd. Check out our gallery of ANA Inspiration winners making the leap into Poppie's Pond.